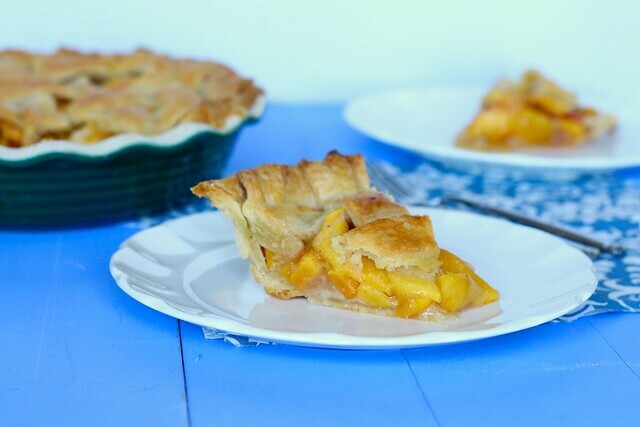 Okay, I swear this is the last peach recipe for a while! I just couldn't resist sharing this recipe with you. Vanilla beans are one of my favorite additions to any dessert. They always add a great depth of flavor. And, they can take any classic/plain dessert to a whole new level of greatness. 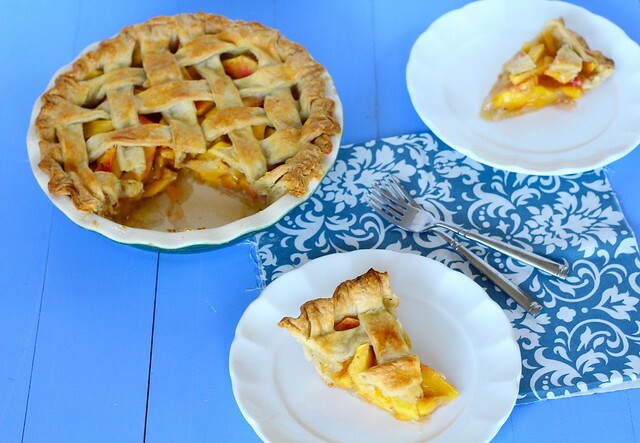 So, when I saw this recipe for a classic peach pie, I thought, why not incorporate vanilla beans! I don't think I have ever actually made a peach pie. So strange, I know. Most likely because only in the last few years, I have discovered my love for peaches. So, I was pretty excited to try this pie out. Since the addition of vanilla beans to my favorite jam worked so well, I figured it would work well in this pie. Boy, oh boy, I was definitely right! This pie is pretty much like eating warm forkfuls of peach jam, sandwiched between a flaky, buttery crust. Oh, and topped with whipped cream, of course. I'll wait while you go and make this pie. Right now. Preheat the oven to 425ºF. Roll out half of the pie dough to about a 12-inch round. Transfer to a pie plate, then place in the refrigerator while making the filling. In a large bowl, place the sugar with the vanilla bean seeds and rub together with your fingers until fragrant and evenly distributed. Whisk in the cornstarch, flour and nutmeg. Peel the peaches and slice them to 1/4-inch thick slices. Combine the peach slices with the sugar mixture. Toss to coat. Add in the lemon juice and stir until combined. 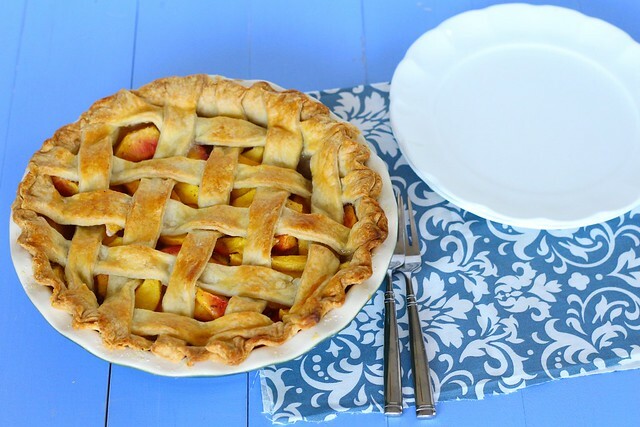 Remove the lined pie plate from the refrigerator and pour in the peach filling in an even layer. Dot the top of the peaches with the pieces of cold butter. Roll out the remaining pie dough to a 12-inch round. Cut into strips with a pastry cutter or knife (a pizza cutter works well here too!) and weave together to form a lattice top. Trim away excess dough and crimp the edges together to seal. Lightly brush the top and edges of the pie dough with the egg wash.
Place the pie plate on a rimmed baking sheet to catch any drips, then place in the oven. Bake for 20 minutes, then decrease the oven temperature to 350ºF and continue baking until the pie is golden brown and the juices are bubbling, about 40-50 minutes more. Remove the pie to a wire rack and let cool until just warm, about 2 hours. Slice and serve with vanilla ice cream or freshly whipped cream.